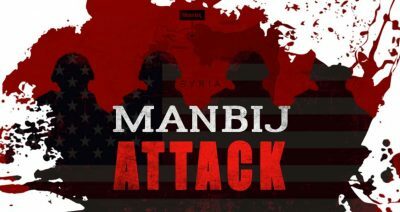 On January 16, a suicide bombing attack hit the center of Manbij in the province of Aleppo. According to initial reports, over 25 people were killed or injured in the attack, which also caused casualties among US service members. Minutes after the explosion, a coalition H-92 helicopter landed in Manbij for an evacuation operation. Later the US military stressed that 2 US service members, a US Defense Department civilian employee and a contractor supporting the department were killed while “conducting a routine patrol” in the area. The names of those killed were not released immediately. ISIS claimed responsibility for the attack and revealed that it was carried out by a suicide bomber named “Abu Yasin al-Shami”. According to local sources, al-Shami blew himself up in front of a US-led coalition patrol outside the Prince Restaurant in the center of Manbij. This was the first successful ISIS suicide attack aimed at US-led coalition forces in Syria. Previous attacks were mainly aimed at US-backed Kurdish fighters and locals cooperating with the coalition. However, the full withdrawal of US forces from Syria still remains in question, especially after another bright media demonstration of the remaining ISIS influence in the country. Earlier it appeared that the US is going to continue its operations in Syrian airspace even when the troops are fully withdrawn. On January 15, Turkish presidential spokesman Ibrahim Kalin said that the US delegation led by National Security Advisor John Bolton conveyed to the Turkish side “an unofficial five-point document in which the United States confirms the withdrawal of its troops from Syria, the determination to continue the fight against the Islamic State terrorist group and Washington’s intention to maintain its presence in Syrian airspace as part of the coalition”. The developing US withdrawal and a reported US-Turkish understanding on a safe zone in northern Syria also forced the Kurdish-dominated Syrian Democratic Forces (SDF) to adapt their approach towards Turkey. The SDF claimed that it hopes to find an understanding with Turkey and promised to provide all necessary help to establish a “safe zone”. However, the group insisted that there should be international guarantees. “We never posed any threat to neighboring countries, especially Turkey, we hope and look forward to reaching understandings and solutions which would ensure stability and safety in the border areas,” the SDF’s official statement said.